It’s true that compensation drives behaviour. The challenge lies in understanding how to structure incentives to drive the activities that will meet your business objectives. If you simply throw money at channel partners and their reps, over time your enticements will no longer resonate. Participants won’t have a clear understanding of what you’re trying to achieve and how they can contribute to that achievement. The promise of a big win at the end of a sale is also no longer enough to keep the channel engaged and focused on achieving. If you consider today’s complex B2B products and solutions, they come with protracted selling cycles. Keep motivation high by offering incentives throughout the cycle. Present a full-spectrum of reward options and include promotions, training incentives, rewards for funnel and marketplace information and more. Don’t make your incentive program too complicated but offer a wide variety of rewards for a wide variety of actions, far beyond the usual X% of sales. The good news is that you don’t need to spend more – not all rewards need to be monetary – you just need to make your program continuously engaging and it will drive rep performance. That’s what full-spectrum incentives can do. When you consider that 5% of reps are generally the high performers, that leaves 95% at the tail end of achievement. If you can motivate even a third of that underachieving rep base, you can achieve double-digit growth. And to do this, you need to offer full-spectrum incentives. The following explains the what, how, when, why and who for offering full-spectrum incentives in your channel incentive program. 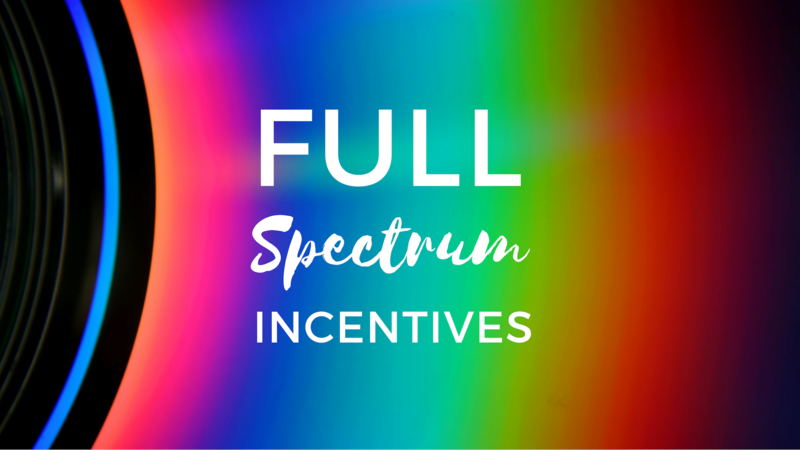 What should be included in your full-spectrum incentive program? No single incentive solution has the power to motivate all. In today’s multi-demographic workforce, you need to spur reps toward higher achievement by addressing all engagement needs, from experiences to merchandise to rewards cards and even non-monetary rewards. Reps are competitive by nature and a gamified leaderboard and peer encouragement on your incentive program’s social platform can be more motivating than cash or a cheque. How should you incent channel reps? If you’re going to incent your indirect sales force, and it must align with your business strategy. Simplify the claiming process so that channel reps receive almost instant gratification. This will do as much for motivation as the type of reward you’re offering. The easier it is to claim, the more sales reps will use your program. And pay quickly. As soon as a claim comes in, process it right away. Don’t wait until the end of the month or the end of the quarter. This will build confidence in your program and encourage reps to get their claims in quickly, rather than holding onto them and forgetting what the reward was for. Your strategy is to keep it fresh in their minds, making sure that they know who the reward has come from and why. Plus, it will increase your visibility. Communication throughout the program is key. Communicate one-to-one with reps, incent them to share product and marketplace information, show them that you’re listening and build a relationship of loyalty and trust. And remember to keep your incentive program fun and competitive by adding gamification. Include gamification in channel communication incentives and training, as well. While organizations expect gamification to increase user engagement by 44%, a recent survey revealed that almost twice as many users (79%) said they would be more productive and motivated if their training was more game-like. Finally, stay on top of the data you’re collecting. Data is useless unless you do something with it, so you want to use analytics that help you identify where the opportunities lie, where you can improve your incentives, and where you can improve your training and channel communications so that you can make the most of your incentive program. When should you incent channel reps? Offer incentives at various key stages of the sales cycle, not just when the sale is completed. Full-spectrum incentives should follow the priorities of your business and reward activities that meet those priorities, including completing brand and sales training, giving demonstrations, meeting revenue goals within certain timeframes and sharing information in surveys and feedback. Combine learning incentives with sales activities throughout. Constant training keeps sales reps current and ahead of the competition. Look beyond just product training to value proposition training, negotiation training and more. You’ll not only be building rep confidence, you’ll be growing brand loyalty. Why should you have an incentive plan? Because they work. They have the power to motivate reps toward higher achievement. Ensure you’re motivating not just the 5% of high performers. Remember, a full-spectrum incentive program has the power to motivate the 95% at the tail-end of revenue performance to achieve double-digit growth. Who should you consider in your incentive plan? If you only consider your own business requirements and objectives, you won’t get the level of engagement you need from the channel. Ensure your incentives encompass the goals of your channel partners and the reps, themselves. The right full-spectrum incentive mix will keep your partners aligned with you and achieve the level of rep engagement that you’re looking for. Forward thinking businesses are designing incentive programs with a powerful full-spectrum incentive mix. And we can help. Over the past 20 years, we’ve driven over $16 billion in revenue through our channel engagement solution. With our Optimize95™ program, we’ve revolutionized the incentive plan to provide full-spectrum incentives that maximize channel rep performance, motivate the 95% of reps that underperform and drive double-digit growth. Find out how to drive double-digit growth in your channels.